Mark Romig grew up in Lakeview, the second of seven children born to devoted Catholic parents who loved their babies, loved the Saints and loved their city. He was a product of St. Dominic School, Brother Martin High School and, eventually, the University of New Orleans, where he learned he didn’t want to be a dentist but he did want to be a leader. 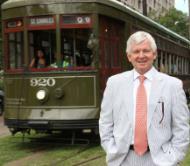 For the past 40-plus years, Romig has found himself telling the story of New Orleans in ways that make New Orleanians proud. From welcoming VIP visitors to the 1984 Louisiana World Exposition just six years out of college to now overseeing one of the most successful New Orleans marketing campaigns the city has ever seen, Romig has proven he’s a home-grown treasure whose heart for the city has inspired him to lay out the welcome mat without trampling on natives’ good will. That’s why the University of New Orleans International Alumni Association has named Romig (B.S., ’78) its 2016 Homer L. Hitt Distinguished Alumnus. It was at UNO that Romig, now 60, discovered the Hotel, Restaurant and Tourism Administration program. It was then a new degree offered through the College of Business Administration—and it would become the perfect career door for Romig, a man who loved to talk, loved to visit and loved to work.